You told me and I finally listened! Gorges State Park is gorgeous (too much? oh well, it's true). From the impressive Visitor Center to the falls themselves, this park is pristine - just beautiful. 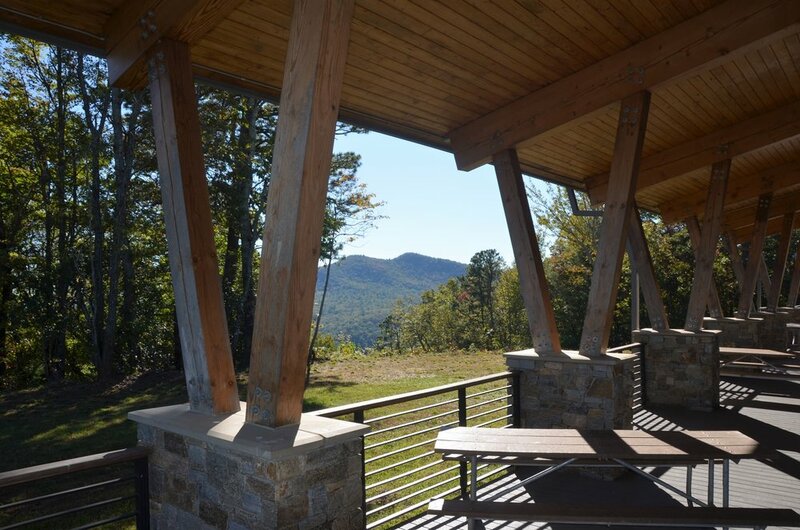 There are picnic shelters with huge fireplaces. Fishing along Bearwallow Creek and Toxaway River. Trails for every level of hiker (including a section of the Foothills Trail with a suspension bridge - I will be back for that one!) Camping adventures. Breathtaking views. I could go on and on but I will refrain as to not completely bore you before I even get to the trail! Oh (and this is important!) 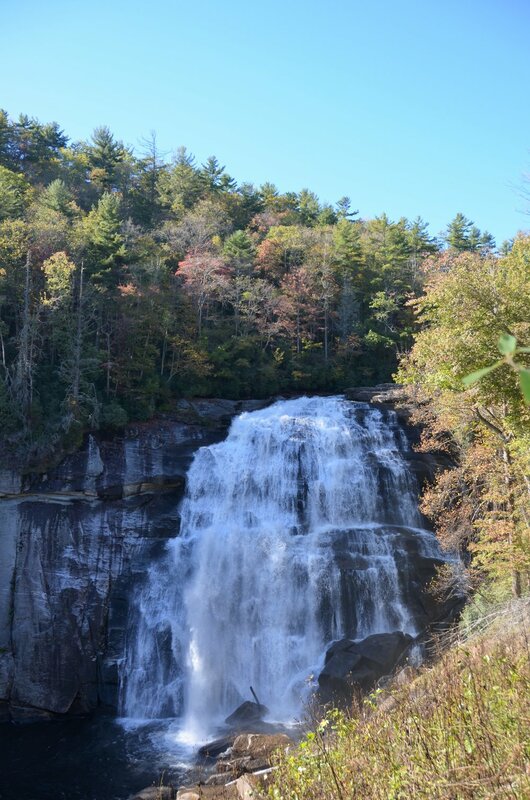 here's the address - with all of the "Gorges" parks and "Rainbow Falls" it can get confusing: Gorges State Park 976 Grassy Ridge Road Sapphire, NC 28774. Tip - do not stop at Rainbow Falls. Just a quarter of a mile further is Turtleback Falls, which is well worth continuing on to. Other notes: There is no fee to get into Gorges State Park. Carry all trash out. Overall park map with Rainbow Falls Trail circled is at the very bottom of the post. Curvy roads with breathtaking views lead you past the Visitor down to the Grassy Ridge Trailhead, where you will find the Rainbow Falls Trail entrance. You will follow the orange blaze. The trail follows the Horse Pasture River upstream. To me, there is nothing quite like hiking deep in the woods, listening to sounds of water flowing by. It's incredibly therapeutic. We hiked this trail mid-October, but it was still warm. The leaves were just starting to turn, as you will see in the photos. I imagine the next couple of weeks will be magnificent for leaf peeping. The trail is considered "strenuous" - but I had my kids with me and it was definitely doable. There are several sets of stairs, but overall we thought it was easy to manage. We made a couple stops along the river and explored, but do be careful. The river is deep and the current is strong. But y'all, talk about relaxing. Sun in your face. Sounds of water rushing past you. Tall trees surround you. Feel like you are there yet!?!!? Continuing along the trail you will hear the sounds of a waterfall getting louder and louder. That moment when you turn the corner and see Rainbow Falls is incredible. It is a glorious 150' waterfall. Really y'all - I cannot say enough good things about this park. I can't wait to go back and explore more of it. And the Visitor Center - I could have snapped photos there all day. An architectural dream with views to match. Unfortunately we walked up right as they were closing it up, so we didn't get to see the inside. If you want to check it out, be sure to go between 9am and 4pm Monday - Friday. On Saturday & Sunday it is open until 5pm.